Three of the biggest names in gaming have come together to create a 3DS game. That's basically all we know. What, did you not read the lede? Seriously, that's all we know! Okay, okay, I suppose I should justify my paycheck somehow, so let's fill this block of text. This scant hint of news comes courtesy a brief mention by Nintendo CEO Satoru Iwata during this morning's Nintendo Direct event. 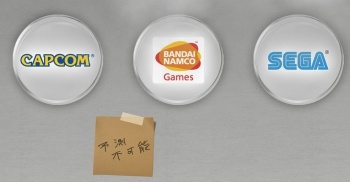 As Mr. Iwata was speaking those baffling words, a teaser site appeared on the 'net featuring the official logos of all three developers (and the lesser known Banpresto), but little else. Here, have a look. The site is in Japanese, but since it offers almost no useful information, you aren't missing much if you can't read Hiragana. So boys and girls, what do we do when presented with a dearth of info? Wait patiently for further news? Of course not! We speculate wildly! Alright, so based on Capcom's renewed love of all things virtual pugilism (and its massive success with Marvel Comics' properties), Namco Bandai's affection for stupid-huge robots and Sega's willingness to support the most ridiculous, poorly-planned ideas known to man, I'm going to assume that this is a 2D fighter featuring Marvel's superheroes piloting giant mechs against one another. You laugh, but seriously guys, that's already a thing. And then, at the end, they take turns kicking Mega Man in the head. Because seriously, Capcom hates that dude.